By virtue of its subject, its methods, and its disciplinary tradition, philosophy of science straddles the borderlines between C P Snow's Two Cultures, connected equally strongly to the learned realm of the humanities and the technological domain of the sciences and thereby linking these worlds. Philosophers of science who engage with scientists or engineers often understand their role as that of the voice of reflection: the philosophical eagle perspective allows them to engage with those questions all too often ignored in the everyday routine of scientific practice: questions about the motivation, norms, values, methods, and limitations of the scientific enterprise. Many modern scientific projects covering all of the disciplines in the natural, medical and engineering sciences urgently require this level of philosophical reflection: large-scale collaborative scientific projects with major impact on our world and society raise concerns about sustainability, safety, objectivity, inter-subjectivity, ethics, and the fundamental concepts underlying the scientific questions, all of which are firmly within the domain of competence of the philosopher of science. This symposium aims to explore the possible and actual interactions of philosophy of science with the scientist's endeavour, including, e.g., historical studies, case studies of current collaborations between philosophers and scientists, the role of philosophy in the academic training of future scientists, and many more topics. The symposium is organised and chiefly financed by the Académie Internationale de Philosophie des Sciences. The convenor is Professor Benedikt Löwe. The organisers acknowledge additional financial support from the Institute for Logic, Language and Computation of the Universiteit van Amsterdam. 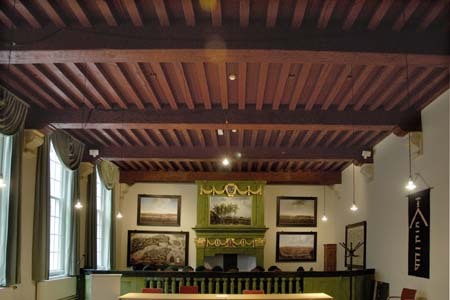 The conference will mainly take place in the historical VOC Zaal in the Bushuis of the Universiteit van Amsterdam. The Bushuis dates back to the mid 16th century and was originally the gun magazine of the city of Amsterdam. In the 17th century, the Dutch East India Company (VOC) made it its head quarters by adding the Oost-Indisch Huis to the building complex (1606). The VOC Zaal where our talks take place was used as the meeting chamber for the Heren XVII (the Lords Seventeen), the board of the VOC elected from the shareholders.